Practically all of the French zone stamps for the new state of Baden that were issued during 1949 were either commemorative postage stamps or commemorative semi-postal (charity) stamps. The stamps shown in the scans above (Mi. #38A-41A (Block 1A), Sc. 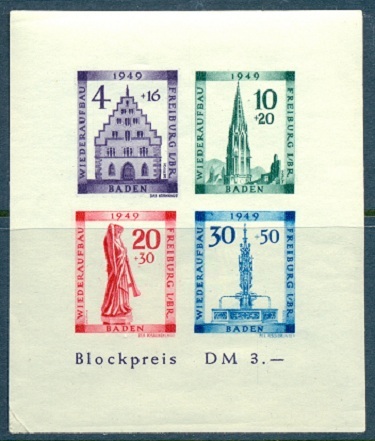 #5NB5-8, #5NB8a) were issued by the state of Baden on February 24, 1949 to publicize the reconstruction of historical monuments in Freiburg. The surtax helped to pay for the cost of the reconstruction projects. The stamps depict the Cornhouse, the tower of the Freiburg Cathedral, the Trumpeting Angel, and the Fish Pool. Souvenir sheets were issued, both perforated and imperforate. The imperforate sheet is shown in the image above (Mi. Block 1B, Sc. #5NB8b). The stamps and souvenir sheet shown above (Mi. #42A-45A (Block 2), Sc. #5NB1-4, #5NB4a) were issued on February 25, 1949 to publicize the Red Cross, with the surtax going to the German Red Cross. 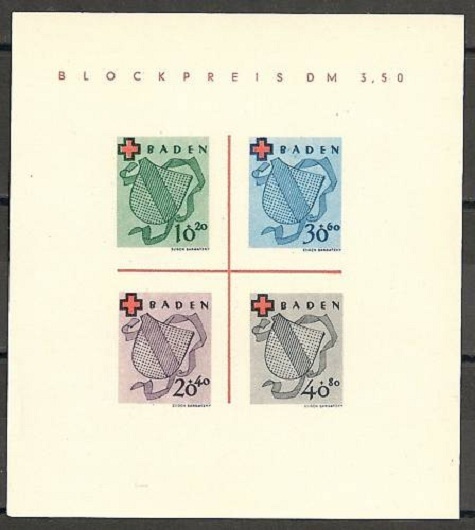 Each of the stamps depicts the coat of arms of the new French zone state of Baden with a red cross above it. The souvenir sheets were issued imperforate and without gum. The 30 Pf. stamp in the top image above (Mi. #46, Sc. #5N41) was issued on June 22 to publicize the Engineering Conference in Constance. The stamp depicts the Constance Cathedral and the Insel Hotel. This stamp comes in two Types. Type I (shown above) was issued on June 22. The type I stamps have a thick frame line and the upper part of the "B" of "BADEN" is narrow. The type II was released at the end of August. The type II stamps have a thin zigzag frame line and the upper part of the "B" of "BADEN" is wide. As Baden became a state of the new Federal Republic of Germany at the beginning of October, the type II stamps were only available for about a month. As a result, they are VERY SCARCE. The three stamps shown in the bottom image above (Mi. #47-49, Sc. #5NB12-14) were issued on August 12, 1949 to commemorate the 200th Anniversary of the Birth of Johann Wolfgang von Goethe. The three stamps depict various portraits of Goethe. The three stamps shown above (Mi. #50-52, Sc. #5NB9-11) were issued on August 24 to commemorate the 100th Anniversary of the Surrender of Rastatt. 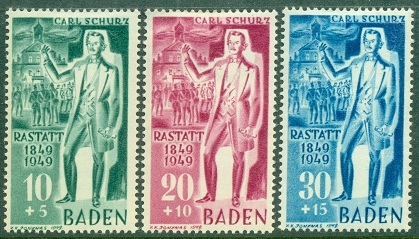 The three French zone state of Baden stamps depict Carl Schurz at Rastatt. Carl Schurz (1829-1906) was a renowned German journalist and revolutionary who took part in the Revolutions of 1848, aimed at unifying all the German States as a constitutional republic. During an 1849 military campaign, Schurz was an adjunct officer to the artillery commander at Rastatt. The revolution in Germany ultimately failed, when the fortress at Rastatt finally surrendered. Schurz was able to escape to Switzerland. In the ensuing years, Schurz was a brief resident of Switzerland, Prussia, France, and then the United Kingdom, where he taught German for a living. He has been commemorated on a number of the stamps of the Federal Republic of Germany over the years, in his role as a great German freedom fighter. In 1852, Carl Schurz left the United Kingdom and immigrated to the United States, where today, he is known as one of the great American journalists, orators, and statesmen of the 19th Century. He is pictured on the 4 cent stamp at the left, which is part of the Great Americans definitive series. His American accomplishments, during the last 50 years of his life, are immense ... I'll try to be "brief"! In 1855, Schurz settled in Watertown, Wisconsin. He immediately became involved in politics, joining the Republican Party, and he was active in the anti-slavery movement. He became a lawyer in 1859, and he was also a speaker for Abraham Lincoln, during the Illinois campaign of that year. This made Lincoln very popular among the German-American voters there. For a brief time, in 1861, Schurz was the American Ambassador to Spain. Later, he was commissioned as an officer in the Union Army during the American Civil War, eventually rising to the rank of Major General. He commanded Union troops at the battles of Bull Run, Chancellorsville, Gettysburg, and Chattanooga. In 1866, he moved to Detroit, Michigan, where he became the editor of the Detroit Post. A year later, he moved to St. Louis, Missouri, where he became the editor and joint owner of the Western Post. While there, he hired a young cub-reporter by the name of Joseph Pulitzer. In 1869, he was elected to the United States Senate from Missouri, becoming the first German-American senator. In 1876, he supported Rutherford B. Hayes for president and was named the Secretary of the Interior. He later became the head of the Office of Indian Affairs. In 1881, Schurz moved to New York, and in 1888, he became the American representative of the Hamburg American Steamship Company. In 1892, he became the president of the National Civil Service Reform League, an office he held until 1901. At the same time, he was also an editorial writer for Harper's Weekly. It is incredible how much Carl Schurz accomplished during his life time. He has the very rare distinction of being a heroic national figure for two countries on two different continents. Of additional note ... His wife, Margarethe Schurz, and her sister, were advocates for child education, and they were instrumental in the establishment of the "kindergarten" system in the United States. The stamp shown above (Mi. #53, Sc. #5N42) was issued by the French zone state of Baden on August 27 to commemorate the 100th Anniversary of the death of composer Conradin Kreutzer (1780-1849). The set of two stamps at the top of the image above (Mi. #54-55, Sc. #5N43-44) was issued on September 17 to commemorate the 100th Anniversary of German postage stamps. The 10 Pf. denomination depicts a mail coach of 1849 and the 20 Pf. depicts an airplane and a mail bus pulling a trailer of 1949. The 20 Pf. stamp at the bottom of the image above (Mi. #56-57, Sc. #5N45-46) is part of a set of two stamps issued on October 4 to commemorate the 75th Anniversary of the Universal Postal Union. There is a 50 Pf. ultramarine stamp of the same design, which is not shown in the image above. Both stamps depict a posthorn and a World globe. Anyone considering specializing in the French zone stamps of Baden should get a copy of the Michel Deutschland-Spezial Katalog Volume II. As is the case with the French zone state of Baden definitive stamps of 1947-1948, the specialization possibilities are tremendous. All of these commemorative stamps come in multiple types, and there are many plate and printing errors in this series. At the beginning of October 1949, the French zone state of Baden joined the newly established Federal Republic of Germany, and their separate stamp issues were replaced by those of the new West German republic.